November 2013: We just received this report from Penninah at UOBDU updating us on the Batwa communities we visited in 2011. 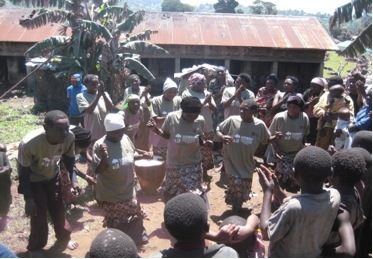 Since the last visit of the Abubilla Music Foundation group to Batwa in Kisoro in November 2011, the six Batwa groups who were visited have continuously promoted the Batwa culture through dancing and music at different stages. The same Batwa groups received dancing costumes and instruments from the remaining funds on the budget which UOBDU had previously been granted by Abubilla. The Batwa beneficiaries include Mikingo, Birara, Gatera, Mperwa, Kanyabukungu and Kabahenda . Therefore this report indicates the procedures used by UOBDU tourism committee that executed the work of purchase and designing the costumes and instruments for all the six groups. On 7th January 2013 the team identified the two service providers who were used by the organized before to design T-shirts and wrappers clothes for UOBDU dancers. community written on back with clothes for wrapping. In addition, each group received six ankle bells, two drums (a big and small). After completion of these dancing costumes, and equipments they were delivered to UOBDU for distribution but this activity had to wait for the Board members to decide on the storage of the costumes since the secretariat had a concern of who to keep the costumes since their huts are very small. In April UOBDU Board convened in Kisoro and agreed that Dancing costumes and other instruments should be handed over to the Batwa beneficiaries officially and all members agreed that storage for the costumes should be done by the secretariat such that incase the dancing group wants to perform they will always inform the tourism officer who should respond positively. Otherwise the rest of the equipment was allowed to be kept by the Batwa themselves with close supervision by the tourism officer. After the resolution the tourism officer went ahead to deliver the equipment and the uniform. All the groups in general were very happy to get such unique uniforms that would make their groups visible; in particular the Birara and Mperwa groups extended their sincere gratitude to Abubilla and singwells for promoting their music. While Mukingo, Gatera and Kabahenda requested UOBDU staff that were distributing these uniforms always to promote their talents such that they can benefit from them. Lastly the Kanyabukungu group appreciated all the stakeholders that were involved in this initiative especially Abubilla Music Foundation and requested for more sensitization for the Batwa to know and help other Batwa groups to form. Since the Batwa received the costumes, Kanyabukungu & Mperwa groups performed before the Uganda Revenue Commissioner General at Cyanika Border with Rwanda. The Commissioner General was so excited by their performance and awarded them UGX 100,000/=. While Gatera group entertained their Area Member of Parliament and rewarded them UGX 150,000/=. In addition Mperwa group was linked to tour guides who usually take tourists to Batwa communities and are entertained at UGX 50,000/= per visit per group. Furthermore, Abubilla Music Foundation sent the Batwa CDs to UOBDU for sell and make money that can support Batwa so far a few CDs have been sold at UGX 120, 000/=.